There are many reasons for wanting to monitor your home with a camera surveillance system. It may be for peace of mind while you are at work or away on vacation. Or even to monitor what the kids are doing after school. Where you place the cameras are an important decision. There are locations that are more effective than others. Burglars can be deterred by the sight of security cameras, so mounting them in plain sight is a good idea. We recommend a professional consultation with South County Sound and Video before installing a surveillance camera system. We will discuss your security goals with you and then advise you on the best locations. Did you know that most burglars break in right through the front or back door? For this reason, a camera should be placed in the front door area. An HD turret camera with motion detection and IR night vision is your best option in these two locations. Turret cameras are extremely durable and very difficult to tamper with. Having outdoor cameras covering your front & back yard plus the driveway is one of the best deterrents against a break-in or other mischief. We recommend installing HD bullet cameras on the left side of the home and the right side of the home looking out diagonally across your property. Of course, the bullet cameras, which have much more flexibility to aim, will have motion detection and IR night-vision. 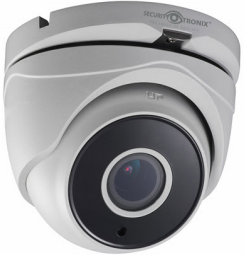 Smaller, less conspicuous HD cameras can be installed to cover areas like the cellar door and windows, or even common family areas that need to be monitored. Indoor cameras are a very personal decision. Every home or family is different, with different goals for what their cameras system needs are. There are many different options. There are two types - the networked, stand alone units, in which the recording takes place on the hard drive within your home. You have complete access to recordings and camera views through an app on your phone or tablet, through software on your computer, or by going directly to the recorder itself. The second is the cloud based recording systems. You pay a monthly fee for your cameras to have recording capability. And again, you have access to recordings and live views via an app or software, but the recording is done by a third party. .Take the guesswork out of the equation by calling South County Sound and Video for a free consultation at 401-789-1700 or by contacting us at office@scsv.net.